← See Some Outstanding Research Tomorrow! Today’s post comes from Kirsten Williamson. Williamson is a senior Studio Art and Film & Media Studies double-major at the University of Rochester, Editor in Chief of LOGOS Art & Literature Journal and Secretary of the Art & Art History Undergraduate Council. In her spare time, she is also one of three SBAI student office assistants! 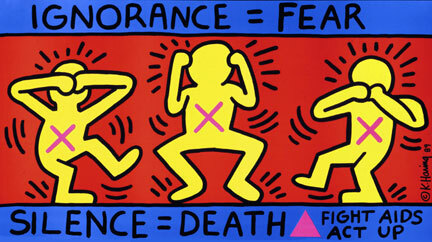 In 2007, University of Rochester’s Rare Books and Special Collections received a donation of AIDS Education posters from Dr. Edward C. Atwater. The collection has over 6200 posters and date from 1982 to present day. Saturday, December 1st marks World AIDS Day. The University of Rochester Medical Center (URMC), the Developmental Center for AIDS Research (D-CFAR), Rochester Victory Alliance (RVA), and many others are hosting many events to raise awareness. It is important to note that RVA at the URMC are developing HIV vaccines and need volunteers. For more information on who can help you can watch this informational video here and by visiting their website. On Friday, URMC is hosting a panel titled “Trying to Understand Sexual Transmission of HIV.” Thomas J. Hope, Ph.D., a professor at the Feinberg School of Medicine, will present. RVA, in conjunction with ABC Faith Hope and Charity Worship Center, will host a forum discussing the impact of HIV/AIDS in our community, on Saturday from 10am-2pm at 44 Columbia Avenue. The panel will feature HIV-positive individuals who will share their personal experiences. At 5pm there will be a candlelight vigil at Upper Falls Boulevard and Hudson Avenue. HIV testing services will also be available at this event, graciously provided by AIDS Care. Following the vigil, the 12th Annual World AIDS Day Benefit Concert will take the stage at the First Universalist Church at 7pm. A short presentation and panel discussion by the RVA staff will precede the show. The Rochester Gay Men’s Chorus will perform. Tickets are just $5 for students ($15 for all others) and are available at the door, as well as at OutLandish Videos and Gifts and Equal Grounds Coffee House. This entry was posted in Guest Blogger, UR Events and tagged #Activism, #AIDS, #awareness, #events, #guestblogger, #hiv, #keithharing, #univeristyofrochester, #worldaidsday. Bookmark the permalink.